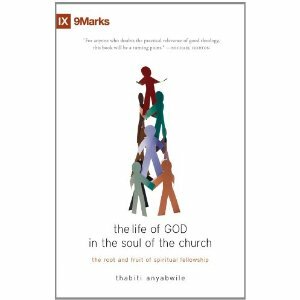 Over the past few weeks I've been enjoying The Life of God in the Soul of the Church: The Root and Fruit of Spiritual Fellowship by Thabiti Anyabwile. The book is actually a series of sermons that Anyabwile preached at his church, First Baptist Church of Grand Cayman, regarding true biblical fellowship. Life of God in the Soul of Man, which urged Christians to practice "genuine, vital, thriving spiritual devotion." (p. 7) By exposition of 1 John 1, Anybwile concludes that "the essence and foundation of all true spiritual and biblical fellowship is the life of God in the soul of man experienced personally by believing the truth and share relationally in the church. (p. 17-18) Part I of the book lays the foundation for Part II, which is the practical application of how church members live in true biblical fellowship with one another. He details the both the importance and proper practice of spiritual gifts. Other chapters center on worship, forgiveness, acceptance, and partnership in the gospel. Anybwile begins and ends Part II with the call to love one another. The Life of God in the Soul of the Church isn't a book for those who are content to sit on the sidelines of church life, whose involvement is dictated by convenience. It gave me much food for thought regarding the significance of the church in the life of the Christian. It opened my eyes to the fact that my life is not my own; I am to share my sufferings, comforts, worship, and gifts with my fellow church members (as modeled by the early church). Quite simply, it is a book that can change the way we do church. Thanks to Christian Focus Publications for allowing me to read and review The Life of God in the Soul of the Church. Thanks for being a part of The Life of God in the Soul of the Church blog tour. Our favorite line from your your review is: "Quite simply, it is a book that can change the way we do church." We're hoping it does exactly that. God bless!